Last week’s long-overdue action on both plants shows we’re replacing fear with fact-based laws and policies. In less than 24 hours last week, Hawaii took historic steps toward a more rational and productive relationship with cannabis and two of its most useful products, medicinal marijuana and industrial hemp. Late Thursday, House and Senate conferees recommended passage of Senate Bill 2659, which establishes an industrial hemp pilot program for the state. The bill is scheduled for final consideration in both chambers on Tuesday; if all goes well, it should be sent on to Gov. David Ige for his expected signature. 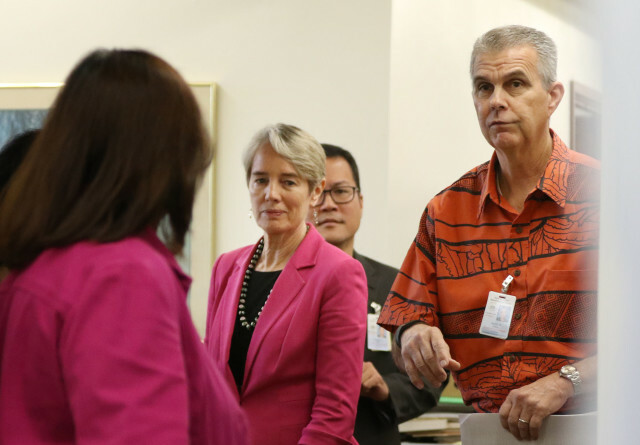 On Friday morning, state Department of Health Director Virginia Pressler announced the eight businesses selected for the first medical-marijuana dispensary and grow-operation licenses on Oahu, Maui, Hawaii Island and Kauai. Each business has until this Friday to accept and pay $75,000 for its license and just over 10 weeks until it may open on July 15. Department of Health Director Dr. Virginia Pressler, center, prepares to announce the marijuana dispensary licensees at Kinau Hale on April 29. Both developments offer good news for Hawaii, for multiple reasons. Here’s why. The creation of an industrial hemp program — championed by the indefatigable Rep. Cynthia Thielen — is an entirely positive development for a product that was pushed to the margins of American society decades ago for no good reason. Industrial hemp has no power to get anyone high, but its close relationship to its trippy sister kept it out of the U.S. marketplace, depriving consumers of numerous high value hemp products. At the height of the same anti-weed hysteria that spawned the cult classic schlockumentary propaganda film “Reefer Madness” in 1935, Congress outlawed hemp through the Prohibitive Marihuana Tax Law in 1937. Though limited cultivation took place during World War II, the last commercial hemp fields were harvested in 1957. That legal sidelining of industrial hemp ignored its long and rich history in the United States. Cultivated by some of the nation’s founding fathers, and responsible for fibers and seeds used in paper, fabric, cooking oil and many more products, industrial hemp nevertheless threatened the businesses of some of America’s leading industrialists, who pushed hard for the 1937 ban. The creation of an industrial hemp program is an entirely positive development for a product pushed to the margins of American society decades ago for no good reason.